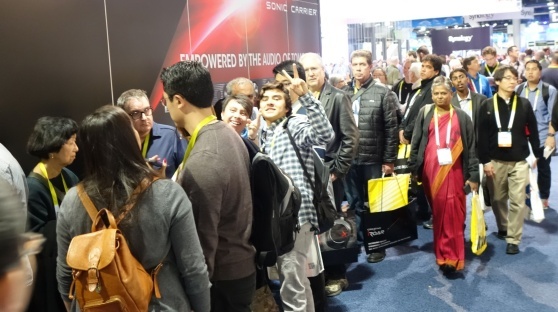 SINGAPORE – 19 January 2016 – Creative Technology Ltd’s ground-breaking X-Fi Sonic Carrier™ launched to an extremely positive response with a crowded booth on all four days of CES 2016. The Creative booth saw long lines outside the Sonic Carrier demo theatrette up until the last hour of the show. A brand new concept in advanced audio and video delivery systems, the Creative X-Fi Sonic Carrier is a high-end lifestyle entertainment platform that brings together all the advanced technologies and convenience in a single beautifully crafted aluminium body. Powered by 7 processors, this technology powerhouse carries a 15.2 high-resolution audio system. 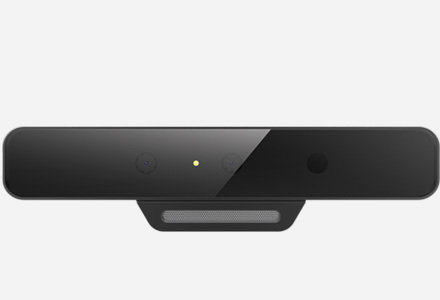 The Sonic Carrier also features an advanced video playback engine that supports 4K (60fps) local and streaming video content, and also comes with 3 distinct wireless technologies that allow multi-room Wi-Fi, Bluetooth®, and a zero-latency speaker-to-speaker link to up to 4 subwoofer units. Utilizing Creative’s proprietary EAX 15.2 Dimensional Audio processing algorithms, the Sonic Carrier upmixes and upscales all kinds of audio signals into a 11.2.4 (front.sub.height) high-resolution audio data that is delivered via its 15-driver main unit and a 2-driver wireless subwoofer. Furthermore, the Sonic Carrier also incorporates Dolby Atmos technology that delivers astonishing, moving audio that fills a room with captivating richness, depth and detail around and above the audience. The Sonic Carrier impressed industry peers, press and trade visitors alike, with most responses saying they felt that the Sonic Carrier delivered a cinema-like experience. “The demonstration of the Creative Sonic Carrier was a genuine revelation, the likes of which I haven't experienced in ages. It excelled as both a room-filling home theatre system and as an impressive implementation of Dolby Atmos technology. Hard to believe that it was just the one box, plus subs. Can't wait to hear the final version,” said Chris Chiarella, a noted audio/video journalist. “I watched the theatrical release of Avatar with my kids in a real cinema. The Avatar demo clip they showed on the new Creative Sonic Carrier was even better than that cinema experience. I could hear the fine details in the jungle atmosphere enveloping me – even the sound of the bugs flying around and above me. It was a hyper-realistic experience,” said Madeline Nelson, CEO of Heads Audio. “Before coming to CES, I was excited to show off the product, yet apprehensive that people might not understand what the product is all about. But the response has been very uplifting. It reinforces our beliefs that we are on the right track with the Sonic Carrier,” said Sim Wong Hoo, CEO of Creative Technology Ltd.
“Our booth was jam-packed. We even observed many industry peers coming back repeatedly to check out the Sonic Carrier. I would like to thank everyone for their tremendous interest, support and accolades. We were all ecstatic to see everyone genuinely impressed by the Sonic Carrier. We can’t wait to share this with the whole world. I would also like to thank my team who worked up until 4am on the very morning of Day 1 of CES. They were working on an extremely tight schedule to put the multitude of intricate technologies and demonstrations together in time for the show,” he added. Dolby Atmos delivers moving audio—sound that can be precisely placed and moved anywhere in three-dimensional space, including overhead. It brings entertainment alive all around the audience in a powerfully immersive and emotive experience. The Creative X-Fi Sonic Carrier (including the wireless subwoofer) is priced at USD5000 SRP. It is available for pre-order now at attractive “crowdfunding-style” price tiers starting from USD1750 (excluding shipping and handling). The launch price of USD1750 was initially limited to the first 100 units, and is now extended to the first 200 units. The pre-order is currently open to Singapore and the United States of America. For more information, visit www.creative.com/soniccarrier. Creative is a worldwide leader in digital entertainment products. Famous for its Sound Blaster® sound cards and for launching the multimedia revolution, Creative is now driving digital entertainment with cutting-edge audio solutions which include premium wireless speakers, wireless headphones, and powerful audiophile-grade amplifiers and digital audio converters. Today, Creative re-invents the Sound Blaster, which has a user base of over 400 million, with its ground-breaking Sound Blaster Roar and Sound Blaster X7 that aim at the new mobile networked generation by bridging the worlds of the computer, smartphones, and tablets. Creative’s proprietary technologies, innovative hardware, applications and services leverage the Internet, enabling consumers to experience high-quality digital entertainment – anytime, anywhere. This announcement relates to products launched in Asia Pacific. Availability is subject to change without notice and may differ elsewhere in the world according to local factors and requirements. Creative, the Creative logo, Sound Blaster, X-Fi, the X-Fi logo, Sonic Carrier and EAX 15.2 Dimensional Audio are trademarks or registered trademarks of Creative Technology Ltd in the United States and/or other countries. All rights reserved. Dolby, Dolby Atmos, and the double-D symbol are registered trademarks of Dolby Laboratories. The Bluetooth® word mark and logos are registered trademarks owned by Bluetooth SIG, Inc. and any use of such marks by Creative Technology Ltd is under license. Other trademarks and trade names are those of their respective owners.